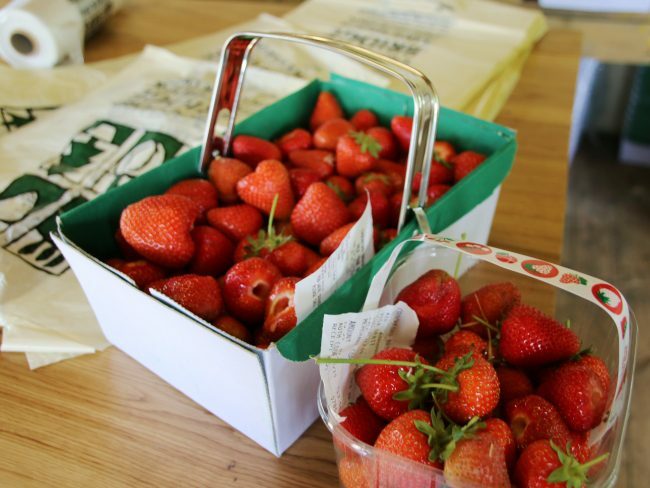 Fresh, juicy strawberries have featured in our breakfast, smoothies, snacks and desserts over the past three days since gathering a hefty 4kg’s worth at Crockford Bridge Farm in Surrey. 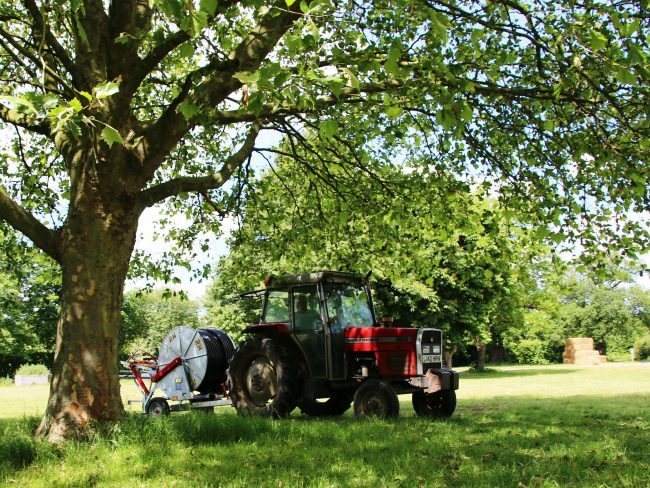 Only 30 minutes away and just off the M25 in Surrey, Crockford Bridge Farm is conveniently located for a morning or afternoon out of Central London. 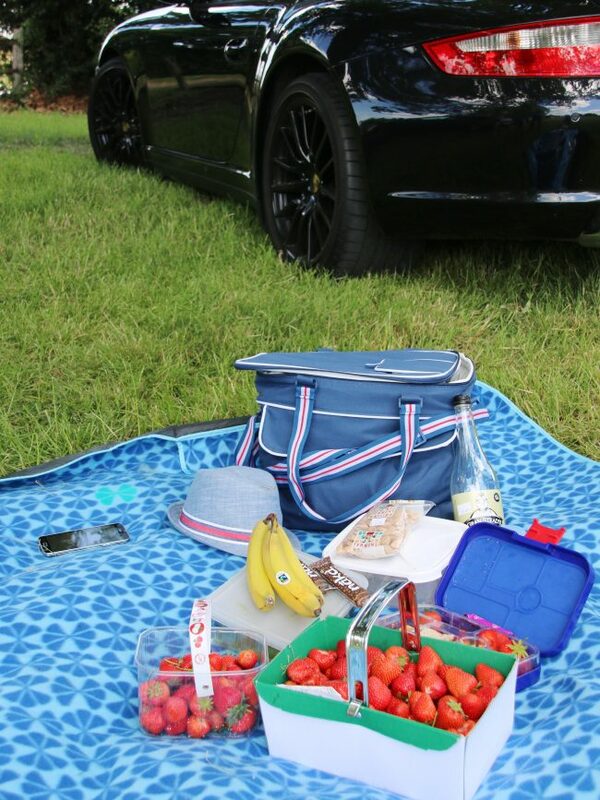 There are two large parking lots, one in front of the Pick Your Own area and the other in front of the Garden Centre, plenty of space to have a picnic and an ice cream parlour with outdoor seating area near a playground. 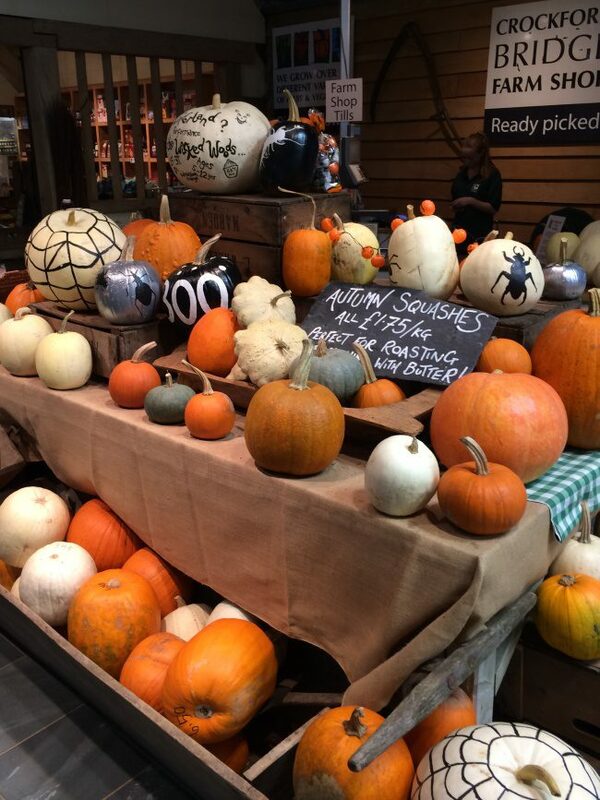 In the Garden Centre, besides the expected plants and shrubs and garden decor, you’ll find a large Farm Shop, restaurant, coffee shop and restroom facilities. 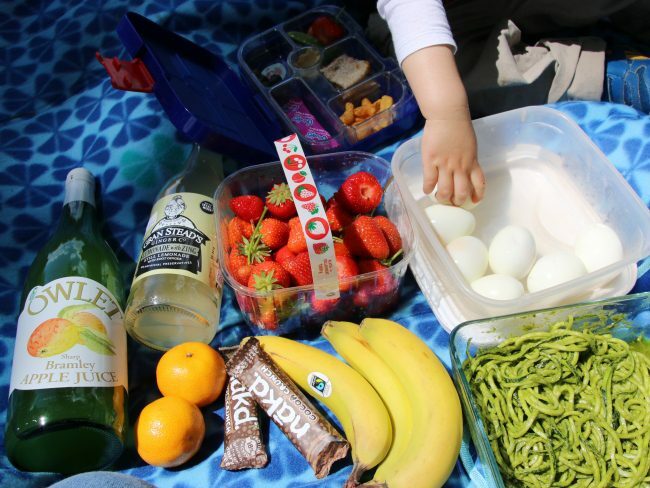 Once we parked the car and bought a couple bottles of water from the Farm Shop, my husband, Little T and I made our way to the Pick Your Own fields and chose our baskets. 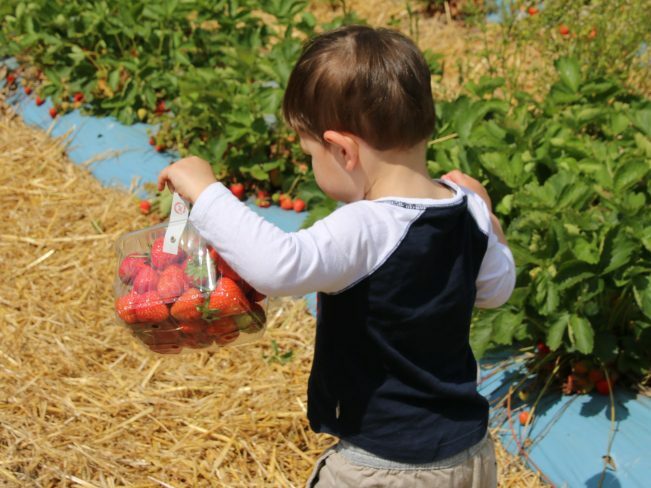 For fruit picking, you use either a large cardboard basket (holds about 3kg), a plastic basket (holds approx 1 kg) or a small plastic punnet (holds approx 1 lb). 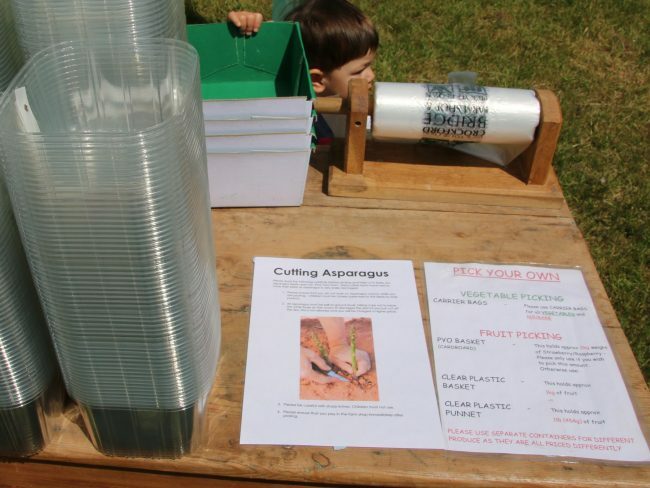 The carrier bags on the roll shown on the right-hand side of the table are for picking vegetables (such as asparagus) or rhubarb. 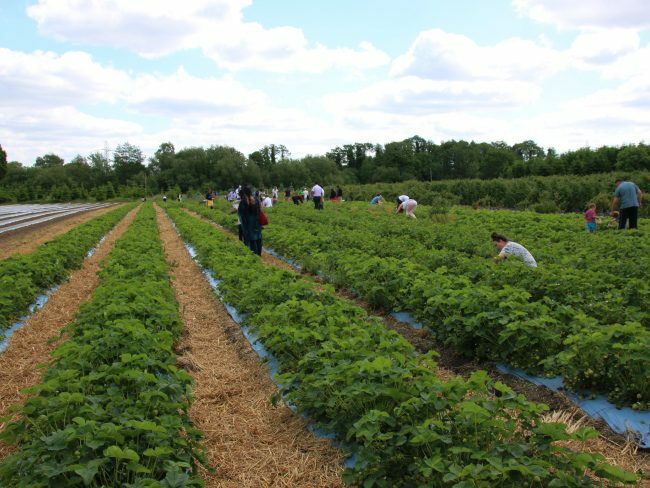 Now armed with a basket each, we carried on to the strawberry fields to start filling them up. 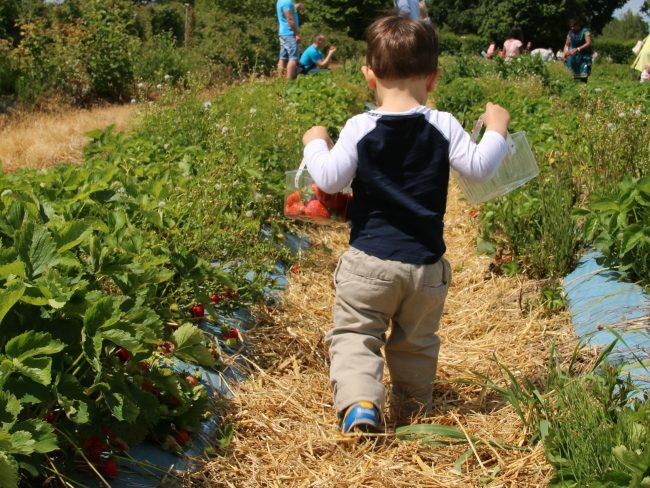 I can’t think of a better crop for introducing Little T to fruit picking. 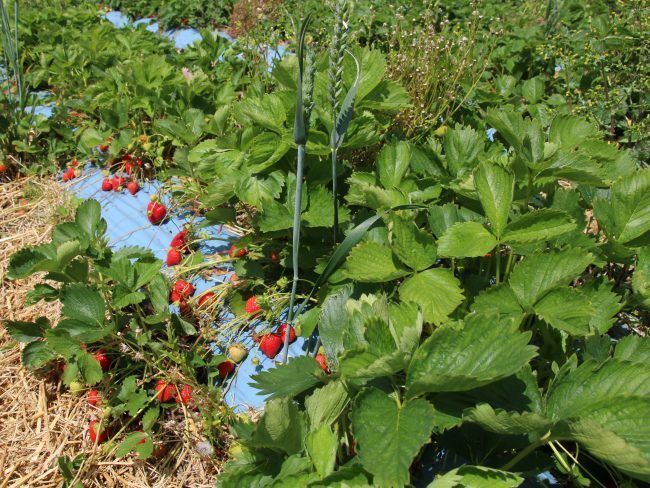 Strawberries are high on his list of favorite foods, ranked up there with blueberries and raspberries, and he was immediately drawn to the bright red familiar shapes peeking out from the rows of plants. 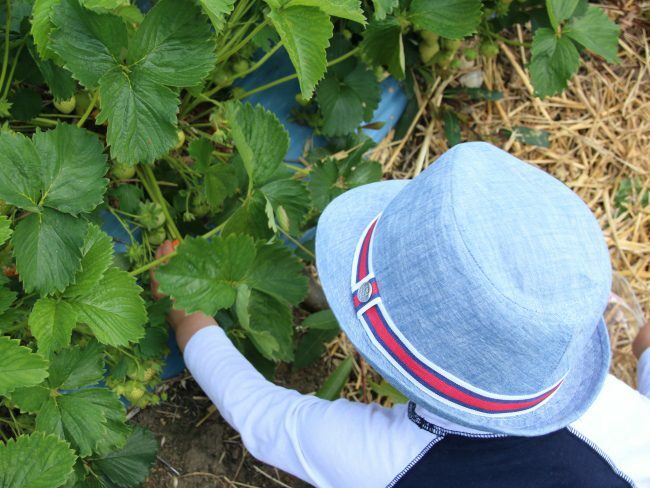 We led him further down the rows until we found a good spot teeming with juicy red strawberries, especially towards the middle of the plants, then we sat down and picked away. We were on the field before 12pm, but I’d recommend coming earlier if possible as it does get busy with people arriving for lunchtime. I think we made it just in time to get a good selection before the crowds got there. We kept an eye and helped Little T to avoid the unripe green ones that still need time to grow and to steer clear of a few ruined ones, otherwise he happily plucked them off the plant on his own and did a great job filling up his basket. It was lovely to see him so involved and engrossed in the task! It wouldn’t be a trip to the farm without a tractor sighting! 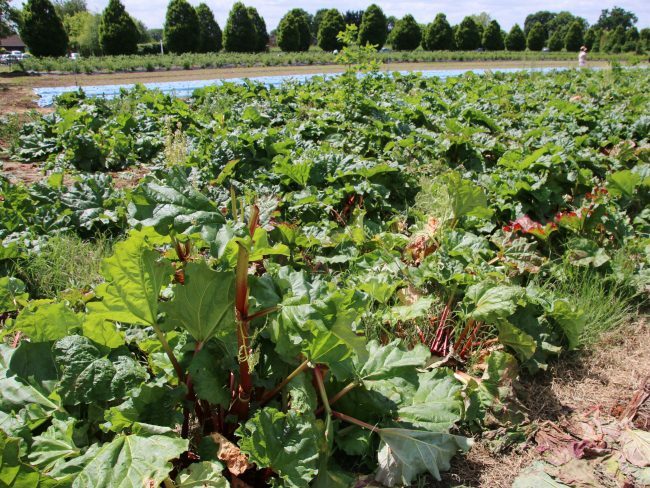 After paying for our strawberries, which turned out to be approximately 4kg for £13.60, we crossed the field to the rhubarb and gooseberry crops. Since we already had plenty to bring home and were starting to get hungry, we just had a look then made our way back to the car park. 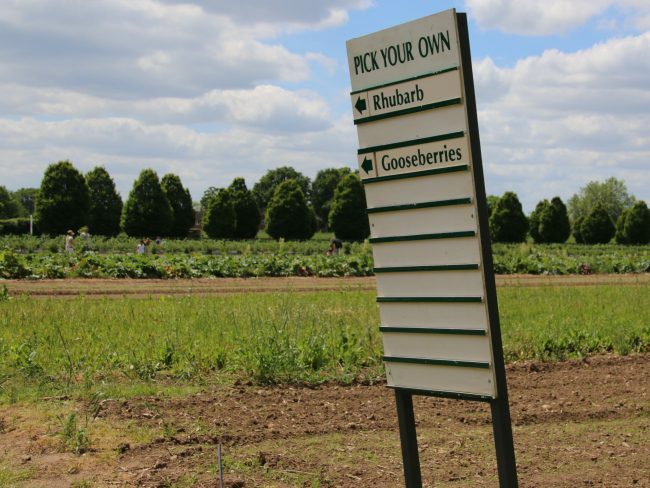 There are loads of crops becoming available for picking throughout the summer, such as raspberries, carrots, courgettes and peas, and you’ll find the latest updates on what’s in season on Crockford Bridge Farm’s crop calendar and Facebook page. We found a quiet spot near our car for our picnic lunch. The building with the cashier at the Pick Your Own entrance (where the baskets were) also has a small sink for washing your fruits or vegetables. 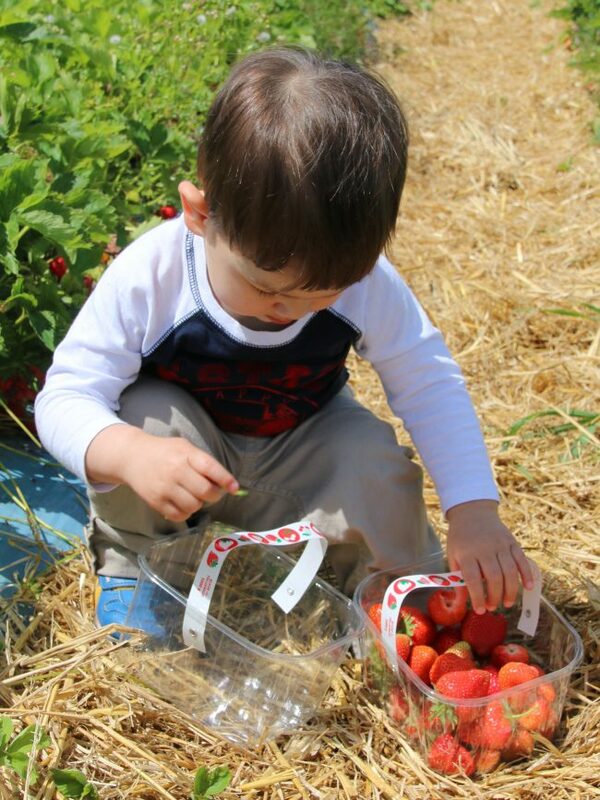 I rinsed the small basket so we could enjoy some of our freshly picked strawberries, or in Little T’s case, take bites out of several and stack them on his Yumbox tray. 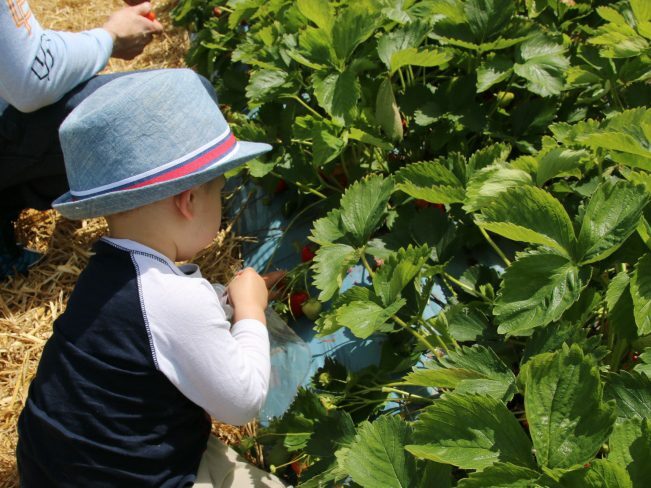 Picking strawberries turned out to be a fun activity for all of us, especially Little T, from plucking the fruits off the plants to, of course, indulging in handfuls of the scrumptious treat. 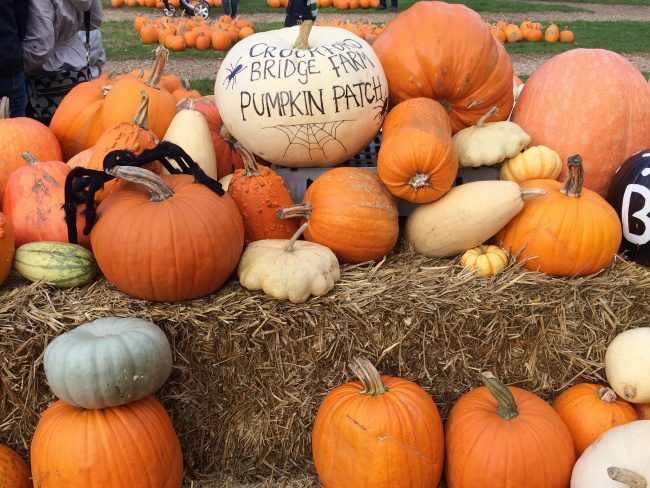 I highly recommend visiting Crockford Bridge Farm for a fun and unique experience. It’s a short drive out of London (check the traffic reports!) and in addition to their farm shop, garden centre and Pick Your Own fruit and vegetables (open May to September), they also offer outdoor activities during the holiday season: dig or cut your own Christmas tree (available from late November) and Santa’s Secret Forest We have had a great time each time we visited Crockford Bridge Farm and hopefully we’ll be back sometime over the summer to try our hand perhaps at carrot or raspberry picking. Opening Hours: May to September, weather permitting. Monday to Wednesday 1000 – 1730, Thursday & Friday 1000 – 1800, Saturday: 0900 – 1800, Sunday 1000 – 1700. Arrive at least 1/2 hour before closing. Tickets: Free to enter. 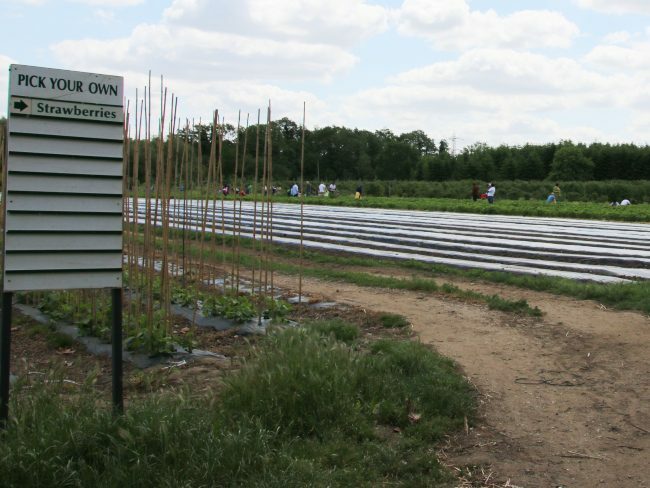 Produce must be paid for immediately after picking. 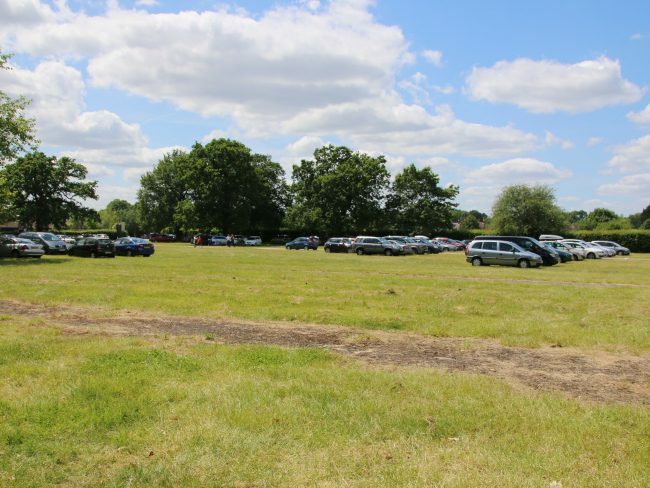 Parking: Plenty of free parking with a large grassy lot located in front of the Pick Your Own entrance, and another parking lot in front of the Garden Centre, which is a short walk away. 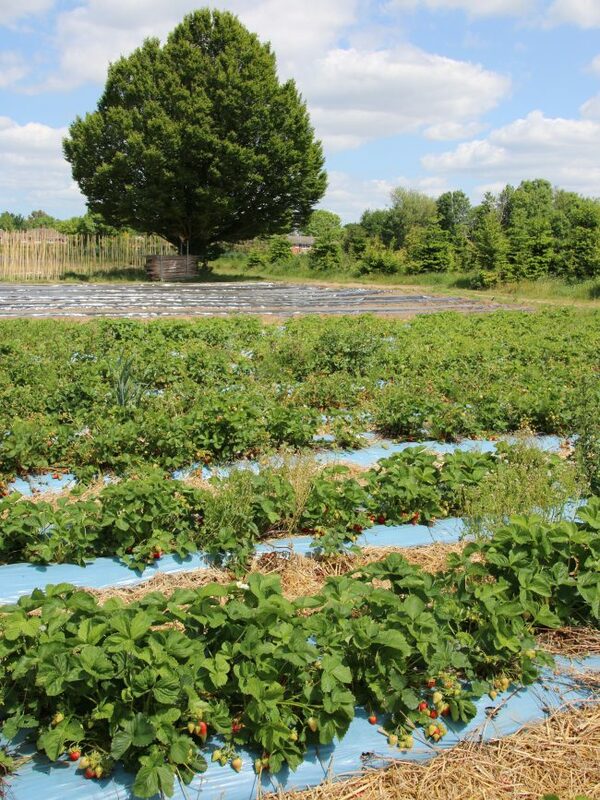 There are more crops becoming available to pick throughout the summer: blackcurrants, raspberries, spinach, carrots, broad beans, courgettes, peas and tomatoes, to name a few. 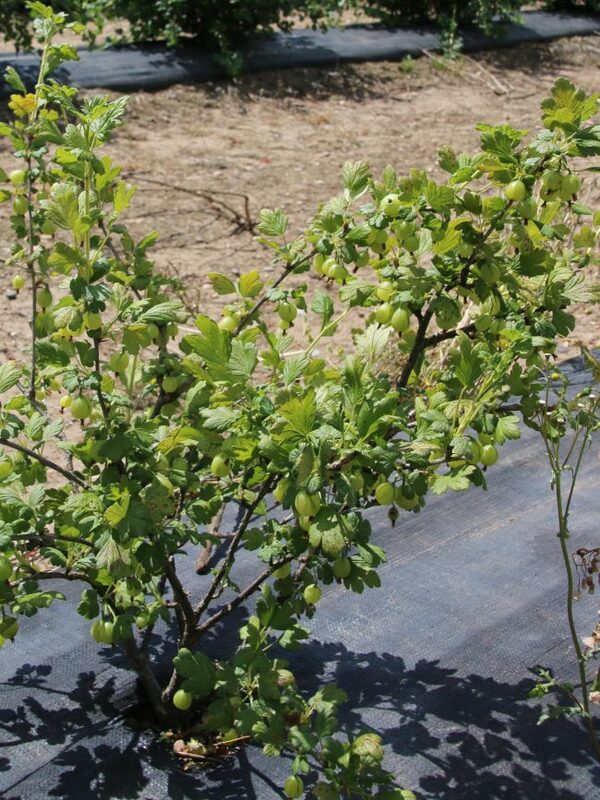 Check the crop calendar to see what’s in season and visit the Crockford Bridge Farm Facebook page for the latest updates. Produce must be paid for immediately after picking and before visiting the other areas of the farm (Garden Centre, Farm Shop etc) – make sure to hold onto your receipt as proof of payment. 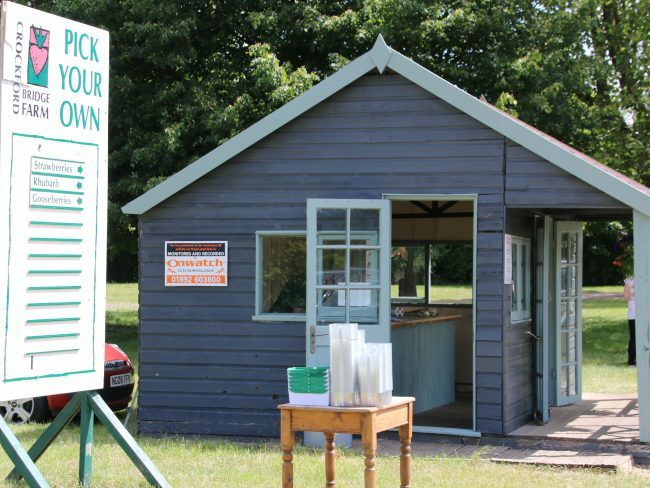 For food and refreshments, there is a restaurant and a coffee shop in the Garden Centre, plus plenty of options at the Farm Shop by the entrance. There is also an ice cream parlour with outdoor seating area near the playground. Restrooms with baby changing facilities are located by the restaurant in the Garden Centre. In addition to plenty of plants and garden decor at the Garden Centre, you’ll find a large pets department with hundreds of aquariums that your little one might enjoy checking out. The Farm Shop sells a wide range of product, gourmet foods, baked goods, eggs and dairy, meats, honey – much of it grown or sourced locally. They also sell a huge range of American treats and goodies, special diet foods (e.g. gluten free) and seasonal products for Easter, Halloween and Christmas. Have a look at the directions and map for Crockford Bridge Farm on the website and always double check traffic alerts on Google Maps or a similar website. When we visited in October, we were delayed about an hour after getting caught in some awful traffic along the M25 South. 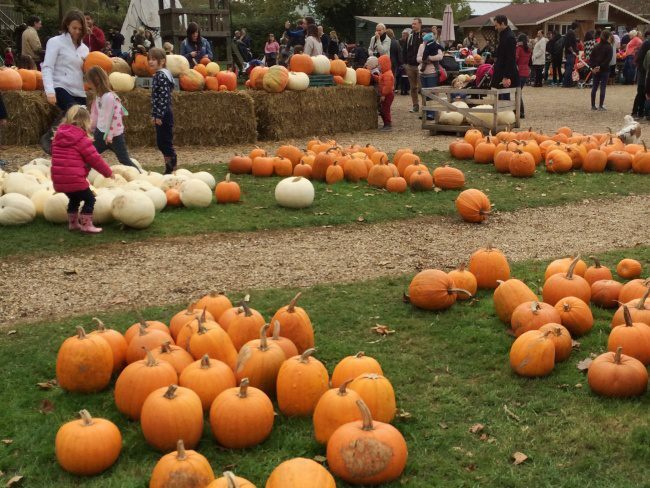 The pumpkin patch experience is slightly different from the States, where you can usually head into the fields to pick your pumpkin. As Crockford Bridge Farm explains on their website, here in the UK, they often experience ground frost at the end of September and early October, which can seriously damage the pumpkins and make their bottoms go soggy, so the pumpkins are picked before and displayed for purchase in their farm shop (from 1st October) or arranged in rows in their “pumpkin patch”, as shown below. All photos copyright Piccolo Explorer. What’s lovely day. We used to grow strawberries in my yard when I was young & I loved picking them. 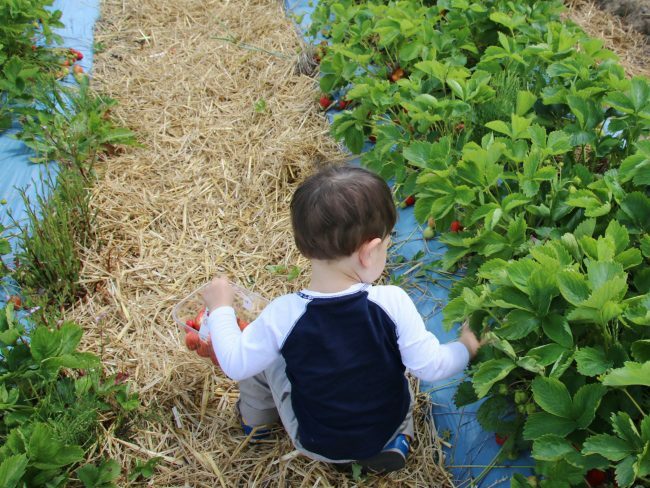 I’m hoping to go berry picking with my boys soon too! 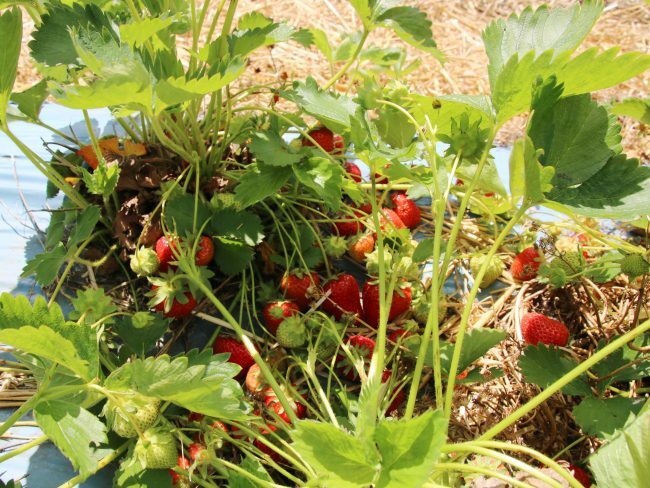 That must have been lovely having your own strawberries in the yard! I’ve always wanted to try to grow my own produce, for now a simple herb planter is all I can manage. Have a great summer! Thanks for stopping by! It was a fun activity and felt good doing something different! Thanks for stopping by! It was a lot of fun! 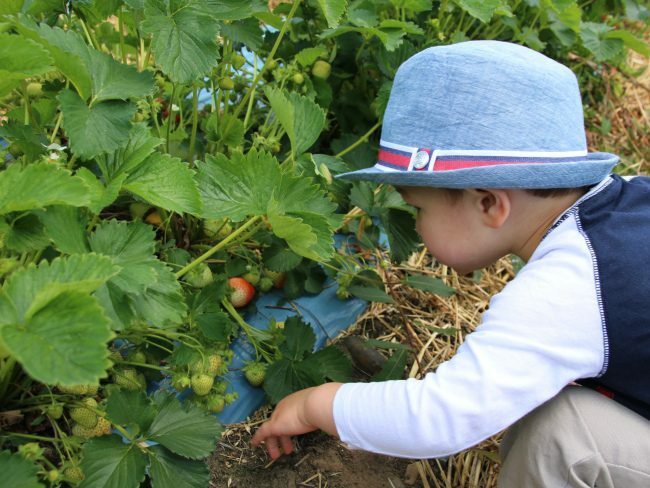 I had to keep my little one from chowing down on the strawberries in the field; it is certainly tempting! 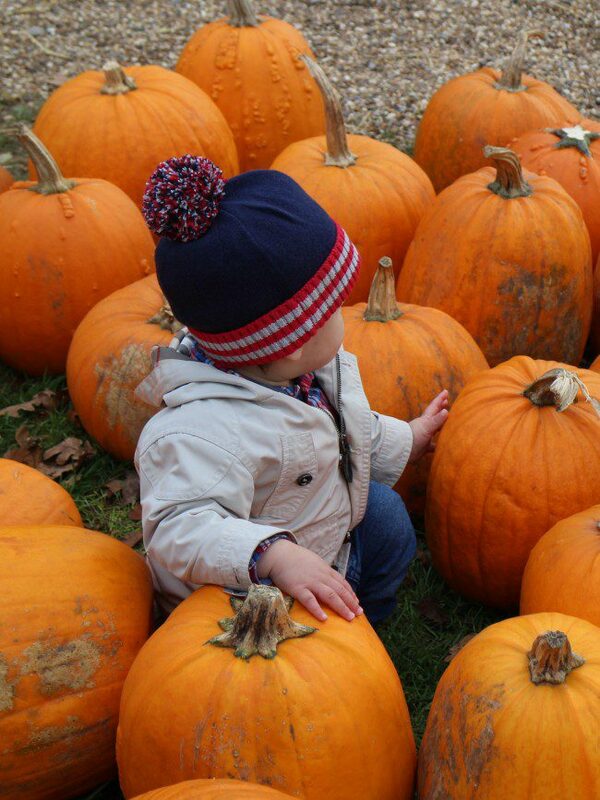 The pumpkin patch was great, going through the photos again had me looking forward to going back before Halloween. Looks like you had a fabulous time – we have a place close to us so we will have to pay a visit there soon. Glad you managed to get a tractor sighting too. Love all those gorgeous photos – they are making me want to get outside and enjoy the countryside right now! Thank you for linking up with #SummerDays this week – really hope you will join in again next week! Thanks, I loved finding new blogs with the #SummerDays linky and will join in again! 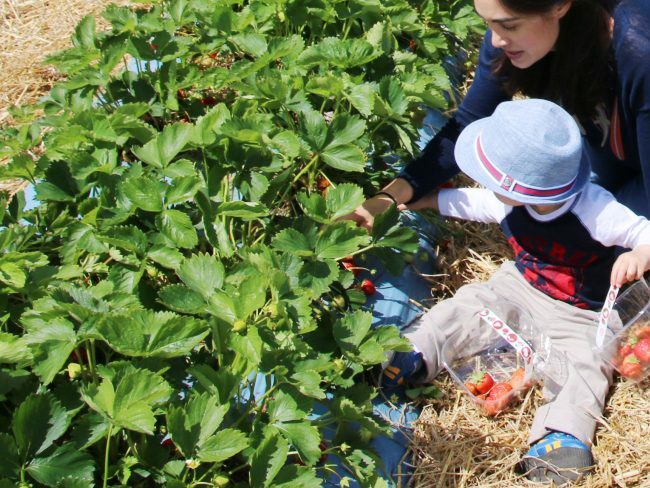 Strawberry picking is something I’ve wanted to do for years so I ended up enjoying it just as much, if not more, than my son! It felt good to be out in the fresh air, hopefully we can start enjoying more sunny days soon.